Helaman’s stripling warriors are looked to by Latter-day Saints, especially Latter-day Saint youth, as examples of great faith and courage. Their exploits are chronicled in Alma chapters 53 and 56 through ­58. The stripling warriors were described as “young men . . . exceedingly valiant for courage, and also for strength and activity.” More than adept warriors, however, the sons of Helaman were “men of truth and soberness, for they had been taught to keep the commandments of God and to walk uprightly before him” (Alma 53:20–21). During one skirmish with the Lamanites, the stripling warriors stood out among their Nephite comrades for their unflinching bravery and obedience at a crucial moment. Just as Ammoron’s forces “were about to overpower us,” Helaman reported, “behold, my little band of two thousand and sixty fought most desperately; yea, they were firm before the Lamanites, and did administer death unto all those who opposed them” (Alma 57:18–19). Just “as the remainder of [Helaman’s] army were about to give way before the Lamanites, behold, those two thousand and sixty were firm and undaunted” (v. 20). Helaman directly attributed the last-minute Nephite victory to the faithfulness of his stripling warriors: “Yea, and they did obey and observe to perform every word of command with exactness; yea, and even according to their faith it was done unto them” (Alma 57:21). This dedication and diligence saved the Nephites from “critical circumstances” (v. 16) that otherwise might very well have doomed the Nephite war effort. The language in Alma 57 to describe the sons of Helaman hearkens back to the language of another ancient military campaign: that of the Israelite conquest of Canaan as recorded in the book of Joshua. As the children of Israel were preparing for war with Canaanite enemies, the Lord commanded them through the prophet-general Joshua, “Be strong and of a good courage . . . that thou mayest observe to do according to all the law, which Moses my servant commanded thee: turn not from it to the right hand or to the left, that thou mayest prosper whithersoever thou goest” (Joshua 1:6–7). This command to the Israelites was repeated throughout the campaign in Canaan (cf. Joshua 10:25; 23:6). It was conjoined with a promise that if the children of Israel were strictly faithful and obedient to all the Lord’s commandments, he would lead them, fight for them, deliver them from their enemies, and prosper them in the land of promise (Joshua 1:8, 23). The book of Joshua retells several instances where the Israelites were routed because of their disobedience to the Lord (e.g. Joshua 7). The clear intention of these accounts was to show the dangers of rebellion, disobedience, and apostasy, especially during precarious times when exacting obedience to God was necessary for collective success and national salvation. On a strictly pragmatic level, the success or failure of a military campaign largely depends on the effectiveness of the combat force. Victory is dependent on troops that are disciplined, loyal, obedient, and quick to execute their commanders’ orders. Helaman’s stripling warriors more than proved their combat effectiveness in their quick, decisive, and unflinching bravery and loyalty in the face of opposition. On a spiritual level, this portrayal of the sons of Helaman may serve to reinforce an important doctrine in the Book of Mormon; namely, “Inasmuch as ye shall keep my commandments, ye shall prosper in the land … Inasmuch as ye will not keep my commandments ye shall be cut off from the presence of the Lord” (Alma 9:13). Much more than merely to acquire wealth, to “prosper” in a scriptural sense is to fulfill righteous desires or promises and, ultimately, to find safety in the Lord’s presence. This was true also for the ancient Israelites, who were promised both temporal and spiritual blessings in the land of promise should they “prosper” by keeping the Lord’s commandments. Likening the tenacity of the stripling warriors to modern followers of Christ, Elder David F. Evans of the Seventy remarked, “In life, it is when the rains descend and the floods come and the winds blow and beat upon us and on our house that we determine whether our faith is strong and whether we put our trust in God continually.” Like the ancient Nephites and Israelites, modern believers can find strength in following their Lord’s commandments, especially in times of adversity. Douglas J. 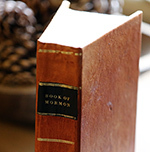 Bell, Defenders of the Faith: The Book of Mormon From a Soldier’s Perspective (Springville, UT: Cedar Fort, Inc., 2012), 89–105. Jo Ann H. Seely, “Stripling warriors,” in Book of Mormon Reference Companion, ed. Dennis L. Largey (Salt Lake City, UT: Deseret Book, 2003), 746–747. A popular Latter-day Saint hymn for children includes the lines, “We are as the army of Helaman. / We have been taught in our youth.” See Janice Kapp Perry, “We’ll Bring the World His Truth (Army of Helaman),” in Children’s Songbook (Salt Lake City, UT: The Church of Jesus Christ of Latter-day Saints, 1989), hymn 172. On the age of the stripling warriors, see Book of Mormon Central, “How Old Were the Stripling Warriors? (Alma 53:20),” KnoWhy 161 (August 9, 2016). Book of Mormon Central, “What Does It Mean To ‘Prosper In The Land’? (Alma 9:13),” KnoWhy 116 (June 7, 2016). David F. Evans, “Tenacity and Discipleship,” Ensign, June 2016, 20.